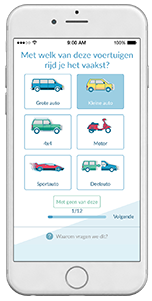 For Good, the app calculating your ecological footprint, received a prize at the Belgian Business Awards for the Environment. The Antwerp scale-up won the Young Talent Award for the ‘Challenges’ it developed. 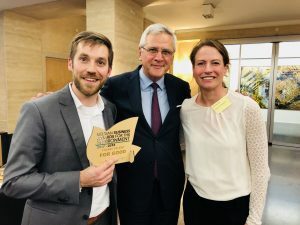 The Federation of Enterprises in Belgium (FEB) organises the Belgian Business Awards for the Environment to applaud companies that succeed in combining economic activities and environmental care through green innovations. Janssen Pharmaceutica, Infrabel, Sioen and Lidl were among the twelve nominees. For Good claimed the Young Talent Award at the ceremony. The start-up is part of the accelerator Start it @KBC, that supports innovative ideas and scalable business models. This year For Good will be setting up a Challenge for Securex. It will also be working together with the province of Antwerp. the province will invite all its inhabitants to a Challenge called ‘de Klimaatstrijd‘. As of March 30 it will challenge its inhabitants and municipalities in Antwerp to not only fight for our planet but also fight each other. The municipality that makes the most progress, can claim the title ‘Municipality with the Smallest Ecological Footprint“. The Challenge will run for a year. At the end of the year five schools will also kick off their own Challenge. For Good has organised successful Challenges with the Adecco Group (2016) and VKO, a high school in Opwijk (2017).